Leaders are required to manage apparently conflicting needs on a daily basis. Paradoxical Leadership methodology allows managers to understand this balancing act and expand their leadership capabilities to maximize organizational performance. Leaders gain the essential understanding of their behaviours and stress responses that can make or break the organization. ParadoxTechnology accurately determines whether a person's strong behavioural traits are genuine strengths or costly derailers. This determination is a crucial consideration most traditional assessments fail to make. Determine if your high performers have leadership potential before promoting them to management. 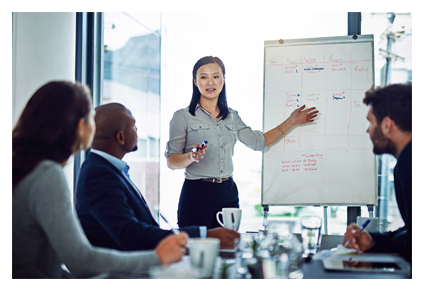 Proactively use the results to identify the high potentials in your organization and use our leadership competency analysis to quickly hone their leadership skills. Does your existing leadership team have the competencies to fulfil your strategic plan? Find out using our customisable Leadership Analytics which measure the competencies that will be needed for each senior management role. Support your managers to become better coaches by using our coaching competency report that compares their behaviours to effective coaching behaviours. Engagement is a psychological phenomenon that is unique to each individual. That's why it is important that you empower your managers with the key data they need to understand and foster engagement for their individual employees. 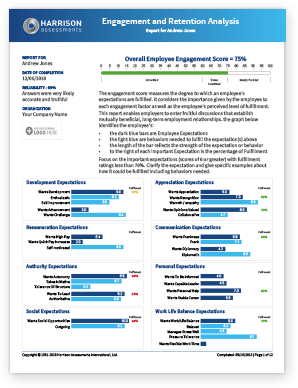 Our Individual Engagement Reports provide a roadmap of each employee's aspirations, expectations and related behaviour patterns in order to maximize engagement and retention. Build leadership pipelines using our Succession Planning Assessment that includes a unique dashboard system making it easy to discover who is ready to move to the next level.